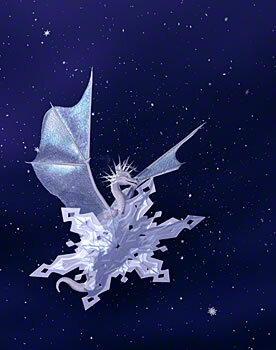 I made this little Frost Fairy Dragon for my free-to-download screen saver/desktop wallpaper for the Holiday 2000 season. It's just a bit of whimsy, but I liked it enough that I decided to make a print available, as well. Besides being much higher resolution, the print has a few extra enhancements. For one thing, the spikes on his little head are now clearly made of ice; it's all frosty and partly transparent. And I gave him little breath puffs, so that you can see how fast he's moving. I made him using B L Render's excellent Dragon Factory which was available at 3D Menagerie, but is now retired. It had bits to make hundreds and hundreds of dragons in Poser® 4, each one different than the last, and each capable of a wide range of expression. 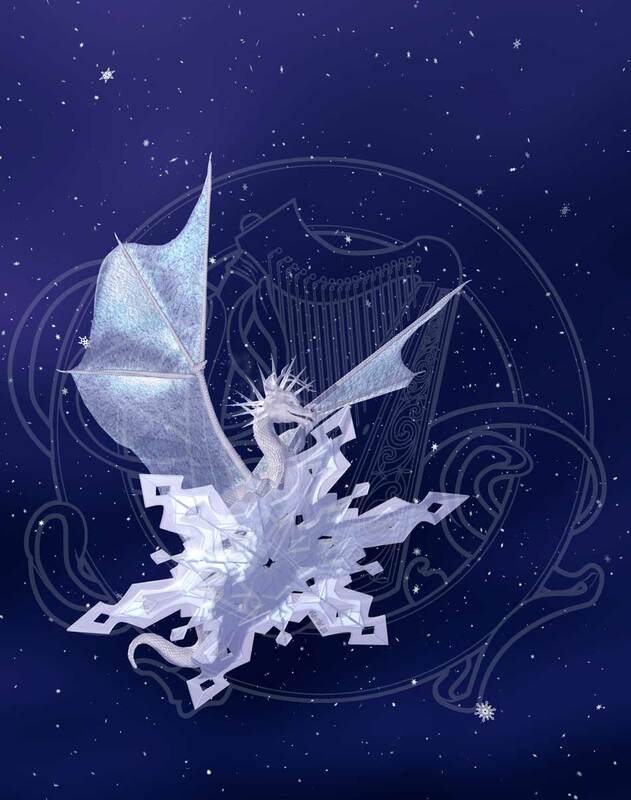 I transferred the dragon into Bryce™, added the snowflake (which I made with Strata® Studio Pro) and textured everything. The snowflakes in the background were made by taking PICT files of a dozen different snowflakes in Strata Studio Pro, and using them to make twelve flat picture planes in Bryce, with transparency around the flake, and plain white for the diffuse and ambient values. Then I duplicated them about 100 times, and used the Disperse function to randomly scatter them all around the picture. I think it worked very well! I called my friend Tay up at 1:00 in the morning to get a title for this piece. (It's alright; she is the one who trained me to stay up all night. She was watching TV, and no where near going to bed yet.) She looked at him, and said, "He's so cute!" and then she named him Snow Shu (to be said with a Swedish accent) because... well... because he is wearing one enormous (to him) snow shoe!